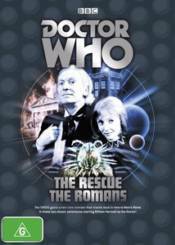 The TARDIS gains a new crew member then travels back in time to Nero�s Rome in these two classic adventures starring William Hartnell as the Doctor! The Rescue - When the TARDIS lands on the supposedly peaceful planet Dido at the end of the 25th century, the Doctor, Barbara and Ian discover a crashed spaceship waiting for help. The only survivors have been murdered by natives apart from a young orphaned girl and a paralysed man. But who is the strange creature Koquillion that they are afraid of? And will they remain safe long enough to be rescued? The Romans - Italy, 64AD. Enjoying a rare holiday with his companions, the Doctor takes Vicki to visit Rome, where he is mistaken for the musician Maximus Pettulian. He finds himself obliged to perform for Nero, or risk incurring the Emperor�s wrath... In his absence, Ian and Barbara have been kidnapped from their villa. Separated and sold into slavery, they face a bleak future. Can they make their escape and find the Doctor before Rome is consumed by fire?